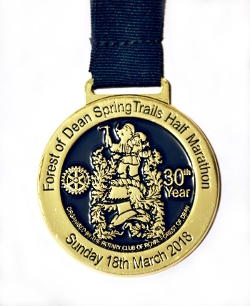 This Spring Trails Half Marathon is run in the Forest of Dean at the end of March, using the same organization (but a different course) as the Autumn event. Starting on the road adjacent to the Speech House Hotel in the heart of the forest, the course then leaves the road to follow a loop of well maintained forest trails (with gentle inclines) before eventually leading back to the Speech House Hotel for the finish. 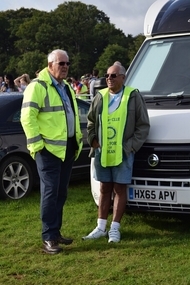 We are very grateful for the involvement and support of a host of individual volunteers, together with a number of local organisations who make this event successful; including the Forestry Commission, the Speech House Hotel and the Forest of Dean Motor Club. 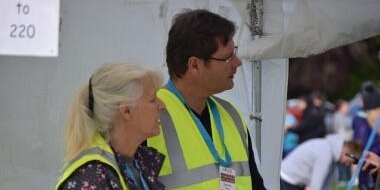 Manual entries will incur an additional £3.00 processing fee. 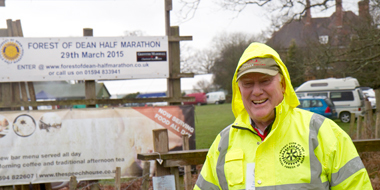 Entries must be received by midnight on Sunday 15th March 2020 at the latest. 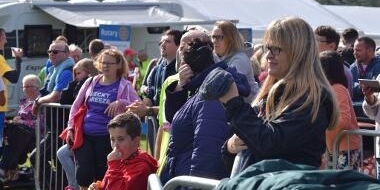 Everyone who registers by this date will be issued with a personalised racing bib containing their timing chip that they may keep as a souvenir of the occasion. 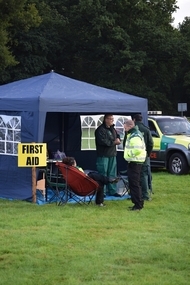 Any remaining entries left following the official registration closure date will continue to be available via the online registration page only at a cost of £40.00. However, please note that any such late entries are provided strictly on a first come, first served basis and will only be available until 6:00PM on Friday 27th March unless they have sold out before then. 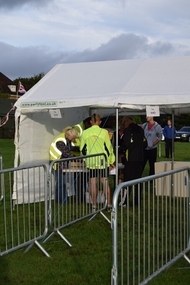 Runners with late entries will be issued with a generic rather than a personalised racing bib. There will be strictly no entries permitted on the day of the race. Following successful registration, every runner will receive an email confirming their registered details, their assigned race number and a link to the event race pack. Please assist us by printing a copy of your details and assigned race number and bring it with you to save time on race day, as it may be impossible for you to retrieve your race number via email at the event itself due to poor mobile coverage. The race pack contains important information about this event, including maps of the course and the start and finish area. Please read it carefully together with the information in the confirmation email. 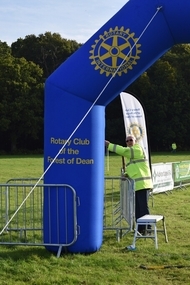 If you fail to receive your email following registration, please contact us at web@forestofdean-halfmarathon.co.uk. 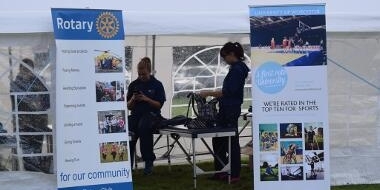 We will, of course, send paper copies to the few runners without email addresses. If you receive race-registration emails for more than one individual, please make sure they receive their copy so they know their race number. 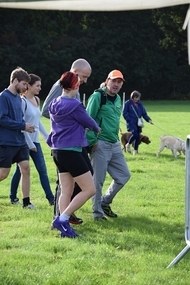 The race course for 2020 will be the same as for the Spring Trails event in the past few years, utilising well maintained forest trails. 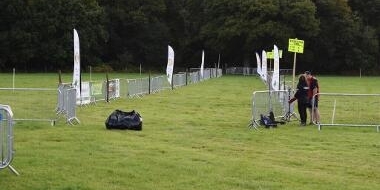 The officially-measured half-marathon course (13 miles 192.5 yards) is run on way-marked trails laid out by the Forestry Commission. Special permission has been given to stage the race over this course. 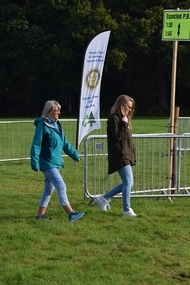 The course begins at Speech House and then follows the trails in a clockwise direction through the Forest of Dean to return to the finish at Speech House. 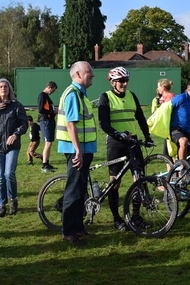 The multi-terrain route will be fully signed and marshalled, and marked by yellow paint on the ground. Mile-markers are provided. The route generally uses well-maintained tracks with gentle inclines. The race will be led by lead cyclists. Roads will be closed to allow runners to cross freely. 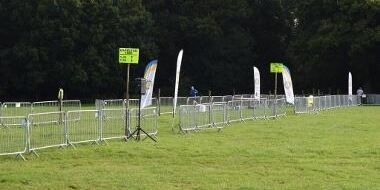 There are three water stations at approximately 5 km intervals, and drinks will be available at the finish. Water stations will be provided at approximately 5km intervals around the race course. Drinks will also be available at the finish. Road running shoes or trainers are perfectly acceptable. 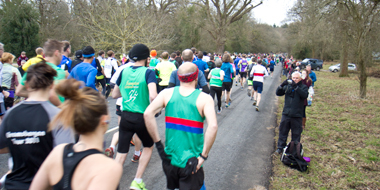 Spikes should not be worn as part of the course includes short road sections. Under UKA rules, race results will be determined by gun timing, while your personal performance will also be confirmed by chip timing. 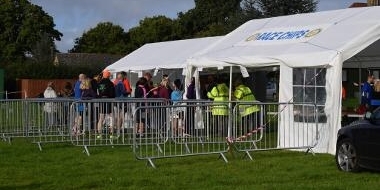 Race bibs with integrated timing chips will be issued on the day of the race from a tent close to the start area. Please make sure you arrive in good time to park and pick up your race bib and chip at least 30 minutes before the event starts at 10:00 am. You will need to quote the race number that was assigned to you when you registered and that was specified in your confirmation email - chip, race number, and registered person must all match! The collection tent will be open on the morning of the race from 8:00 am and will close at 9:45 am in preparation for the race itself. Remember to bring some small safety pins to fix your race bib to your vest. If you're stuck, some pins will be available from the collection tent. We will not be collecting the race bib and integrated chip after the race, so feel free to keep it as a souvenir (or dispose of it thoughtfully)! 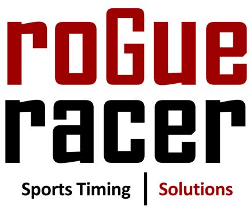 The timing services for the forthcoming race will be provided by Rogue Racer, a company with a wealth of experience in supporting similar events. 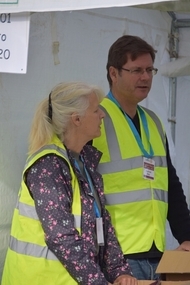 Individual results will be available on the day from the timing team themselves with the final overall results being uploaded to the event web site as soon as the team and category results have been collated. Individual gold, silver and bronze medals will be awarded to the first three in each of the eleven race categories. 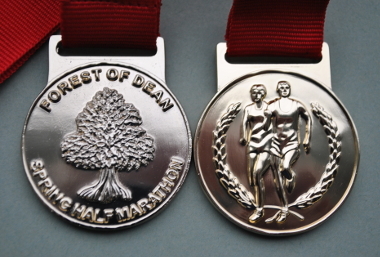 A medal (with ribbon) will be presented to every finisher. 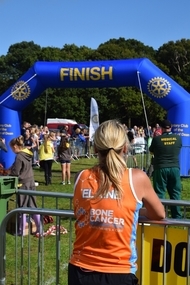 In addition, Top 50 Athlete t-shirts will be awarded to the first 50 Male and first 50 female finishers.